Car and Truck Suspension Problems in Denver? Suspension systems should continue to operate effectively for many years and thousands of miles, but eventually components do wear out. How long it takes for them to wear out depends a lot on how you drive. As you can imagine, if most of your driving is on smooth Colorado highways, your vehicles shock absorbers will last a lot longer than if you do most of your driving on bumpy Denver roads or hauling heavy loads. In addition to just wearing out, upgraded shock suspension components can be damaged in an accident or just by a hard impact – like hitting a pothole, curb or a rock in the road. Because the life span of shocks can vary so widely, your vehicle manufacturer recommends periodic inspections. During a car inspection at Express Car Care, your service technician will check for worn, broken or missing suspension parts. If the inspection reveals any problems, it’s important to have them taken care of quickly. When you do need to replace your shocks, it’s usually a good idea to replace all four at the same time. This will give you even handling at all four corners of the vehicle. If you have special road handling needs – like – improved cornering or towing and hauling requirements in Denver, your Express Car Care adviser can recommend an upgraded shock or strut that will meet your needs. At Express Car Care, we have been providing quality auto repair in Denver for over ten years. Ask manager Rob about transmission service and windshield wipers. We are here to help with all your auto repair needs. Give us a call @ 303-691-2760 or come in and see us. Filed Under: Car Maintenance, Suspension Tagged With: Suspension Problems in Denver? Does Your Car Need New Shocks or Struts? Search the Internet today and you’re sure to find a lot of stories about people not having the best of luck with auto repair shops. Which means when its time to trust a mechanic to make sure your car is in top working order, it can be difficult to determine who to trust – and who to steer clear of. An oil change is one thing, but what happens when you think you may need a larger problem fixed, such as shocks and struts? Shocks and struts aren’t like some car parts that need to be replaced on a regular basis or at a specific mileage. Some original shocks may need replacing after 30,000 to 40,000 miles; struts often last to 50,000, 60,000 or even longer. One way to evaluate your need for new shocks and struts is to consider how your car handles on a daily basis. Does it bounce excessively when you hit a bump or drive down a bumpy road? Does the nose of your car dip down when breaking? Does the body of your vehicle roll or sway when cornering or driving in crosswinds? Does your suspension bottom out when backing out of driveway with a car full of passengers? The bounce test is one of the easiest ways to tell if your car needs to shocks and struts. But it isn’t the only way. In some cases your shocks may start to leak – you can easily see oil or wetness on the outside of the shock or strut. In some cases your original equipment may not be well suited for the requirements you are placing on it. Do you pull a boat or camper on a regular basis? Are you in construction, hauling on a daily basis? Upgrading and installing stronger, special shocks and struts can give you better performance overall. Worn out shocks and struts won’t necessarily create a driving hazard, but there are studies that show they can increase the distance needed for stopping a vehicle, or increase skidding on wet surfaces. And they most definitely will improve the overall quality of your ride. Shocks and struts are generally replaced in pairs – though it isn’t always necessary if only one shock or strut is leaking, or if they have relatively low mileage. 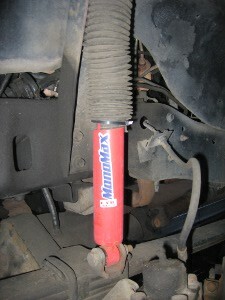 While shocks can be a fairly easy replacement project, struts are more difficult. They require a fair amount of suspension disassembly, and most wheels need realigning after replacement. Have any questions? Remember, its always better to check early and face a potential problem head on. The quicker you get the problem solved, the less damage and potential loss of use of your car you’ll experience. Filed Under: Suspension Tagged With: Does Your Car Need New Shocks or Struts? Suspension systems should continue to operate effectively for many years and tens of thousands of miles, holding your tires footprint on the road. Eventually components do wear out, but how long that takes depends a lot on how you drive. As you can imagine, if most of your driving is done on smooth Colorado highways, your vehicles shock absorbers will last a lot longer than if you do most of your driving on bumpy Denver roads or hauling heavy loads. In addition to just wearing out, upgraded shock suspension components can be damaged in an accident or by a hard impact – like a pothole, hitting a curb or rock in the road. Because the life span of the suspension system can vary so widely, your vehicle manufacturer recommends periodic inspections. During a car inspection at Express Car Care, your Denver service technician will check for worn, broken or missing suspension parts. If the inspection reveals any problems, don’t neglect to take care of this important safety and handling work. When you replace your shocks, it’s usually a good idea to replace all four at the same time. This will give you even handling at all four corners of the vehicle. If you have special road handling needs like improved cornering or towing or hauling requirements in Denver, your Express Car Care adviser can recommend an upgraded shock or strut to help with your specific needs. At Express Car Care, we have been providing quality auto repair in Denver for over 10 years. Ask the manager, Rob, about transmission service and windshield wipers. Although “winter” driving hasn’t been an issue for us yet. There are plenty of construction zones in the city, where our cars shocks and struts are put to the test. Knowing when to replace the shocks and/or struts on our vehicles doesn’t have to be difficult. With a little bit of knowledge the decision can almost be made for you. The first thing to know is that not all vehicles have both shocks and struts. Some vehicles have only struts and some have only shocks. Shocks are usually a single cylinder in the open and a strut is normally surrounded by the coil spring , creating a suspension assembly, but both shocks and struts serve the same purpose. Their main function is to keep your vehicle from bouncing. Each vehicle has front and rear springs that help to cushion it over rough road conditions. 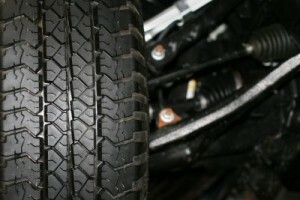 Shocks and struts are designed to help keep the tires on the road. 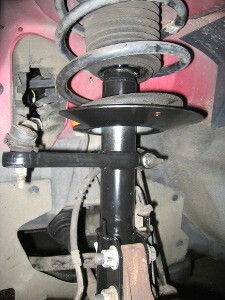 Shocks are normally used in the rear suspension on a vehicle, whereas struts are on the front. Some trucks have shocks on both the front and the rear, but they both achieve the same thing. They control the action of the spring to resist bottoming out, ( like when you hit a pothole), and keep the movement of the springs under control as they rebound. Because of all the road construction in our area, rough roads and potholes are everywhere. If your car continues to bounce long after you hit a pothole, it might be time to replace the shocks and struts. 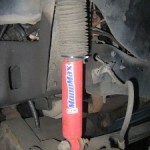 Worn out, damaged or leaking shocks and struts need to be replaced. Leaking is easy to see by looking for oil or wetness on the outside of the shock or strut. Damage is also pretty easy to see – look for a broken mount, badly dented housing, etc. Shocks and struts that may be worn out are more difficult to judge, so preventative checkups are the key to avoiding them. Have your technician check them every time you have an oil change. Because the damping characteristics of shocks and struts deteriorate gradually over time, if you begin to notice the need for them, it’s usually way past the point when they should have been replaced. Other signs of when to replace worn shocks and struts. When stopping quickly, does your car rock back and forth several times? When applying your brakes firmly at higher speeds, does your vehicle have a tendency to drift to the left or right? When changing lanes quickly does your car rock or sway from side to side? A “bounce test” is still a valid way of knowing when to replace shocks and struts. If the suspension continues to bounce more than one or two times after rocking and releasing the bumper or body, your shocks or struts are worn and need to be replaced. Since many of us here in Colorado drive front-wheel drive vehicles, it’s important that we keep an eye on the CV joints to make sure they aren’t in need of repair. Front-wheel and all-wheel drive vehicles transfer the power from the transmission to the wheels through a drive axle assembly. These drive axles have constant-velocity (CV) joints at each end. A CV joint is a group of bearings and cages that allow the axle to rotate and deliver power at different angles so that the axle can change its length as it moves up and down. The CV joints are protected by rubber boots that keep dirt and contaminants out and a protective layer of lubricant in. Just like everything else in life, these rubber boots can crack or tear over time. If moisture and dirt get inside a CV joint and the lubricant leaks out, due to normal wear and tear, there is a greater potential for CV joint failure. The signs of possible CV joint failure are clicking or crackling sounds while turning, clunking sound during accelerating or sudden deceleration. You might also notice front-end vibrations. If you haven’t noticed anything unusual you should still have the CV joints checked routinely to keep you ahead of the repairs but if you think your vehicle is showing any of these signs give us a call at 303-691-2760 or come in and see us before the damage becomes more costly to repair. During the winter, as we are driving around on roads that may or may not have had the snow or ice from the prior day removed by a snowplow. While we are bouncing and bumping along, we might wonder if all the movement we are experiencing is actually caused by the road conditions or is it time for us to replace the shocks and struts on our car. If you have found yourself asking that question anytime recently, I invite you to click on the link below for one of our earlier blogs and see if the information there helps you determine the answer. Shocks and Struts-How Do You Know When They Need Replacing? If you visit any auto repair shop regularly there is a good chance you’ve seen ads for replacing shocks and struts. But is there a way to tell if your shocks and struts need replacing without taking your car to a repair shop? One way to evaluate if they need replacing is to look for damage or leaking. Leaking is easy to see – just look for oil or wetness on the outside of the shock or strut. Damage is also fairly easy to see – look for a broken mount, or dented housing. Another way to evaluate your need for new shocks or struts is to consider how your vehicle has been handling and riding. When you drive on rough roads or hit a bump, does it bounce excessively? Does the nose dip down when braking? Does the body roll or sway too much when cornering or driving in crosswinds? Is it easy to bottom out the suspension when backing out of the driveway or when you’re hauling extra passengers or cargo? Because the damping characteristics of shocks and struts deteriorate gradually over time, the decline in ride control often passes unnoticed. When you begin to notice the signs, it’s usually way past the point when your shocks or struts need replacing. Shocks and struts do not require replacing at specific mileage intervals like filters or spark plugs, but they do wear out and eventually need to be replaced. Monroe engineers, America’s leading brand of shocks and struts, suggest following a 50,000-mile replacement plan just to be safe. Driving on worn out shocks can be a hazard over time. Worn out shocks and struts may cause your stopping distance to increase, especially on rough surfaces. They can have a negative impact on your driving capabilities, especially in adverse conditions. Worn out shocks and struts can also cause damage to your tires prematurely, meaning you’ll have more expense than is truly necessary. Express Care is a family owned auto repair shop in the Denver, Colorado area that offers a variety of services, including shock replacement. Conveniently located at Evans and I-25, we look forward to doing business with you. Shocks and struts serve the same purpose,their main function is to keep your car from bouncing. A car has front and rear springs to cushion it over rough road conditions. Shocks and struts are designed to help keep your tires on the road. There is a slight difference between a shock and a strut. Shocks are usually used to depress leaf springs and are usually a single cylinder in the open and a strut is normally surrounded by the coil spring and is bigger and more complicated. Because of that, it usually costs more to replace a strut than a shock. 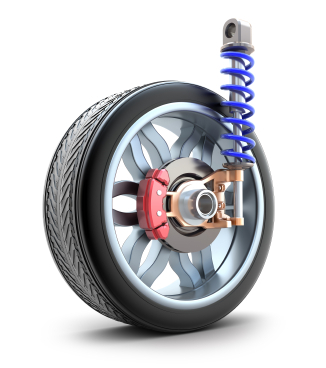 Shocks are normally used in the rear suspension on a car and struts are on the front. 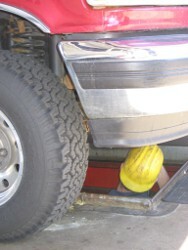 Some trucks have shocks on both the front and rear. But they both achieve the same thing. They control the action of the spring to resist bottoming out, like when you hit a pothole, and keep the movement of the springs under control as they rebound. Since we have so much road construction going on in our area, potholes are in abundance and if your car continues to bounce long after you’ve hit one, you should have your car inspected for possible shock or strut replacement. Do you experience excessive bounce ( 3 or more bounces) when crossing an intersection or dip? On a tight curve like a freeway ramp, does your car lean and sway giving it an uneasy and disconnected feeling? If you experience any of these signs you should have your car inspected by a trusted service technician, (like us)! They can help you correct the problems , prevent further damage to your car, and restore that comfortable ride we are all looking for! Have an older car? Want to keep it in the best shape possible? 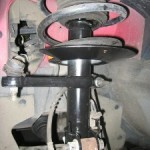 It’s time to purchase new shocks and struts if your original shocks and struts are worn out, damaged or leaking. Leaking is easy enough to see – just look for oil or wetness on the outside of the shock or strut. Damage is also fairly easy to see – look for a broken mount, badly dented housing, etc. But wear is often more of a subjective thing to judge. There are also instances where the original equipment shocks may not be worn, damaged or leaking, but may not be adequate for the job they’re being asked to do. In such cases, upgrading the suspension with stronger, stiffer or some type of special shock and strut may be recommended to improve handling (for trailer towing, hauling overloads or other special uses). Shocks and struts do not require replacing at specific mileage intervals like filters or spark plugs, but they do wear out and eventually have to be replaced. How long a set of original equipment shocks and struts will last depends on many factors. Some original equipment shocks may be getting weak after only 30,000 or 40,000 miles. Struts usually last upwards of 50,000 or 60,000 miles. Because the damping characteristics of shocks and struts deteriorate gradually over time, the decline in ride control often passes unnoticed. If you begin to notice the need for shocks and struts, it’s usually way past the point when they should have been replaced. One way to evaluate your need for new shocks or struts is to consider how your vehicle has been handling and riding. Does it bounce excessively when driving on rough roads or after hitting a bump? Does the nose dip when braking? Does the body roll or sway excessively when cornering or driving in crosswinds? 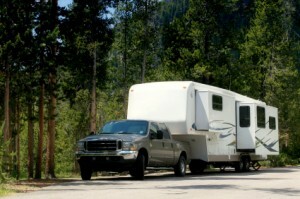 Does the suspension bottom out when backing out of the driveway or when hauling extra passengers or weight? If you are a regular at any car repair shop, chances are you’ve seen the ads for shocks and struts. But without taking your car in for a check up, is there a way for you to determine when it’s time for shock replacement on your car? 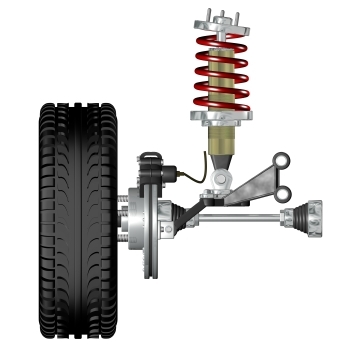 Different manufacturers of shocks and struts provide different guidelines for their products. Many mechanics will tell you it’s not as cut and dry as it is with oil changes and spark plugs. Instead, it depends on the circumstances of your driving habits, and the overall characteristics of your car. Instead of relying on mileage as a test, its more important to know the habits of your car. Start with the “bounce test”. A bounce test is easy to perform: simply apply pressure to the body or bumper of the car to bounce the car. If the car continues to move up and down more than a time or two after release, the parts are showing wear and should be replaced. You can also notice your cars behavior. When you drive on rough roads or hit a bump, does it bounce excessively? Does the nose dip down when breaking? 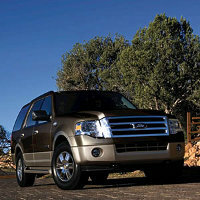 Is it easy to bottom out the suspension when backing out of the driveway or hauling extra passengers or cargo? Any of these could be a sign your car is in need of a shock replacement. And driving on worn out shocks can be a hazard over time. Worn out shocks and struts may cause your stopping distance to increase, especially on rough surfaces. It can have an impact on your driving capabilities, especially in adverse conditions. And they can cause damage to your tires prematurely, meaning you’ll have more expense than is truly necessary.